I can’t believe that this is finally happening. The English translation of “Aroos Amman” is finally ready and up for pre-orders. It is already out there on Amazon.com (paperback)! and a publishing date is set on 21th July. I am so happy about the translation and so thankful for Ruth Ahmedzai Kemp who has done a great job in brining my written words into English. I am also very thankful for my publisher (signal8press) for the great work put into ensuring best quality of the English production. It was a long process but I enjoyed working with both of them and witnessed them shaping what I thought to be a good book even better. When I first started blogging in 2006, I wanted to communicate issues of sexual and body rights that were not addressed by traditional media at the time. I could see how our cultural heritage and obsession in regulating sexuality is making an already tough life due to economical conditions even tougher. I wanted to open missed debates around these issues in hope of change. Few years down the road, I was able to collect my thoughts into a full story, a novel that came out in January 2012. At the time, I didn’t anticipate this success of Aroos Amman, and didn’t anticipate the huge amount I received. People seem to be fed up with the old doctrine that limits their body and sexual freedoms. They are happy to see someone bringing it up right front and are ready to fight for it themselves. Today with the book coming out to English, I am hoping for a wider reach that could trigger even bigger change. Thank you all for your love and support. 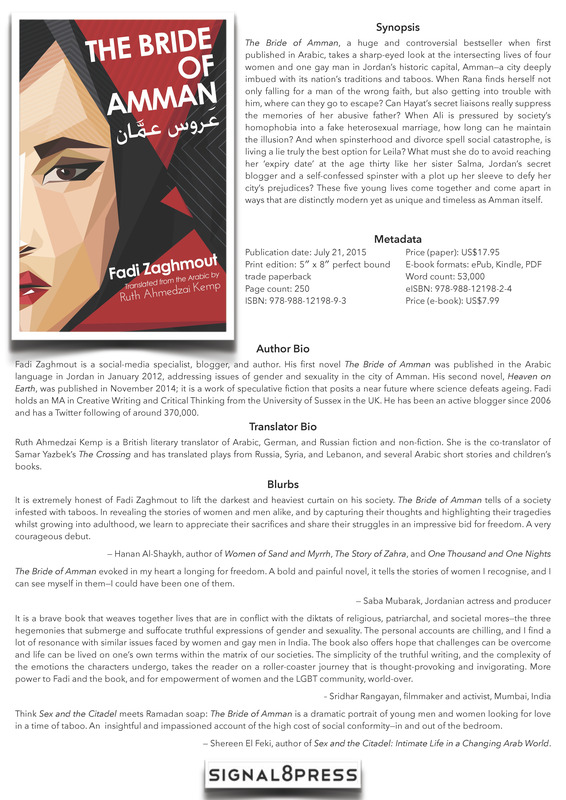 I dedicate this book to Arab young men and women: those who are struggling to conform, those who are fighting for autonomy over their own bodies, and those advocating for sexual rights. This is a well written comprehensive review by Jona for Janna Ala Al Ard published on Arablit blog today. 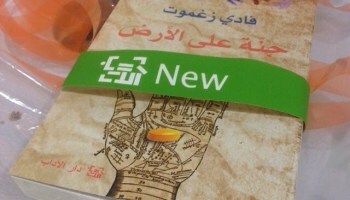 Fadi Zaghmout’s Paradise on Earth (Janna ‘ala l-ard; Dar al-Adab, 2014) has been labeled a “science fiction” novel — although a more precise description might be “speculative fiction with futuristic elements.” It is the Jordanian writer’s second novel, following The Bride of Amman (2012), to be published in English translation by Ruth Ahmedzai Kemp later this year. Like Bride, Janna explores interpersonal relationships and the issues individuals face when their desires and ideals clash with societal norms — but this time, with a futuristic twist: The novel’s central premise is a form of medicine that can reverse human aging, and in effect grant eternal life.